Hello, and welcome back to the Sun Valley Animal Center blog. 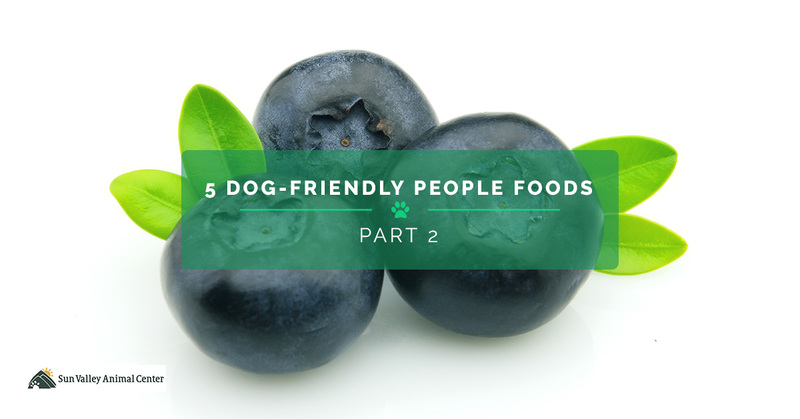 In our last post, we started looking at some of the best people foods that are safe and healthy for dogs to eat. Because there are so many wonderful raw foods out there that provide our furry friends with the filler-free nutrition they need and love, we will continue looking at a few more of these foods today. Substituting regular store-bought treats with these raw foods may help strengthen their bones, improve their coat’s shine and texture, help reduce digestive issues, and improve weight management. Additionally, these fruits and veggies can be mixed into their normal meal of kibble for added vitamins and minerals. Blueberries are a delicious treat for your dog. These little blue gems provide high amounts of vitamin C, are rich in fiber, and jam-packed with antioxidants that help protect your pet from free radicals which can lead to cellular and molecular issues in dogs. What’s more, blueberries are a low-calorie treat that helps to strengthen your pup’s immune system. Blueberries are the perfect size for carrying as a quick treat while taking your dog for a walk, and are easily mixed into their kibble for a boost of vitamins. For an added benefit, try mixing mashed up blueberries with coconut oil and aloe vera and treat your pup to a calming blueberry facial that will soothe, hydrate, and refresh the skin and hair on their face. Don’t forget to get their noses! The next time you cook salmon for yourself, you may want to share some with your pup, too. Salmon contains omega-3 fatty acids that can improve your dog’s skin and coat, making it healthy, shiny, and soft to the touch. What’s more, these fats also support your dog’s immune system, and may even help those pups who suffer from allergies. The caveat here is that the salmon should be cooked to avoid any parasites that may live on raw fish, which could make your pup sick. These spuds are a great treat for your buds! Sweet potatoes are versatile when it comes to dogs; when sliced and dehydrated, sweet potatoes make the perfect chewy treat to help maintain the health of your dog’s teeth, while strengthening the muscles they use to chew. If you’d like to implement sweet potatoes into their meal of kibble, make sure the potatoes are cooked thoroughly, cooled, and cut into small cubes. These orange potatoes are rich in fiber and provide a wealth of vitamins, including vitamin C, beta-carotene, manganese, and vitamin B6. There’s nothing better than biting into a juicy apple, and most dogs would probably agree. Apples are a crunchy treat that, like carrots, help clean your pup’s teeth with every bite. Apples provide vitamins C, calcium, and are rich in fiber. Do not feed them the core and make sure you remove all the seeds from the apple before feeding it to your dog, as apple seeds contain cyanide, according to the American Kennel Club AKC. This concludes our short blog series on healthy people foods to feed your dog. Make sure to check back next time as we explore the human foods that you’ll want to avoid feeding your dog. If you would like to bring your dog to our animal hospital for pet nutrition counseling, dentistry, or have questions about our surgery services, contact our team at Sun Valley Animal Center today.